Application are invited from Indian citizen in the prescribed standard form as published in Assam Gazette Part-IX from the intending candidates for filling up vacant posts as mentioned below under District Agril. Office, KKB Road, Jorhat-785001. The last date of application is 18th December, 2015. Educational Qualification: Passed VIII Standard. Age: 18 to 38 years as on 01-01-2015. The upper age limit is relaxable up to 5 (five) years. In case of ST and SC as per Govt. rule in force. Application Fee: Application fee for Rs. 50.00 (Rupees Fifty) only is to be paid through Indian Postal Order in favour of District Agricultural Officer, Jorhat payable at Jorhat along with the application. a) Attested compes of pass certificate along with age, cast and domicile certificates etc. b) Two copies of recent passport size photographs duly self attested. Application may be submitted to the District Agril. 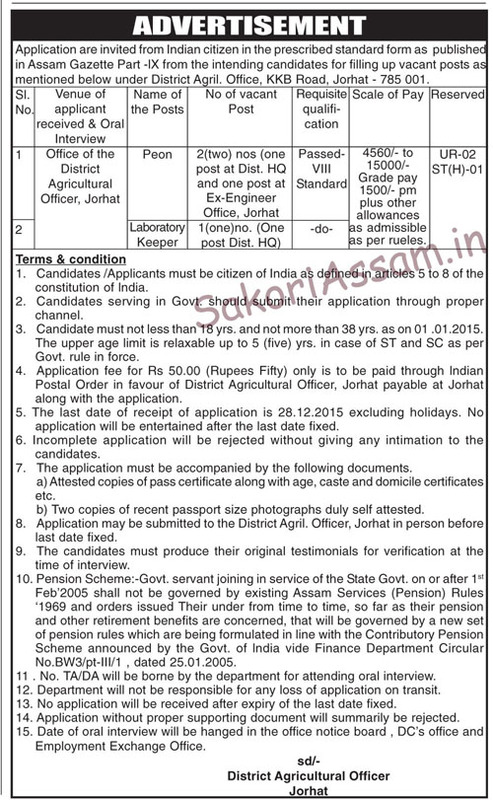 Officer, Jorhat in person berfoere last date fixed. The candidate must product their original testimonials for verification at the time of interview. Date of oral interview will be hanged in the office notice board, DC’s office and Employment Exchange Office.